Take a tour through our building and grounds. Finished in 1902, the main building is home to our Residential and Day Treatment Programs as well as the Bansbach Academy. Our historic building looks lovely in the winter. Visitors are greeted at the Front Desk. Social Studies is a favorite class for many students. School projects line the walls. The computer lab helps kids explore the world. Healthy, whole grain, organic food is served for breakfast, lunch, dinner and snacks. The Tenenbaum Cafe looks much the same as when the building first opened in 1902. Kids can earn incentives for positive behavior and demonstrating leadership. The health office helps manage medications and occasional bumps and bruises. The Wolf Pack Cafe is our student-run coffee cart business. The Learning Kitchen is a great place to learn everyday life skills. The Art Therapy Studio is an important part of our healing philosophy. Kids explore through clay, paint, found objects, charcoal and oil sticks. Music Therapy is a critical part of our therapeutic offerings. Kids use songwriting and lyric analysis to explore their feelings and to find positive coping tools. Therapy dogs visit regularly and help relieve tension and stress for kids and staff alike. The Fit! Room helps kids stay active. Exercise helps improve your mood and is an effective coping tool. These machines improve hand eye coordination and are great for brain development. The Fit! Room is used by the Health/P.E. classes during the day and by the dorms at night. Special play therapy rooms are available for use by therapists. Play therapy is a powerful tool for engaging children in treatment. There are five residential dorms at DCH, each with their own design. All new residential clients receive welcome kits that include colorful new bedding, a journal, stuffed animal, water bottle, hygiene items and more. The leisure rooms includes games, foosball, table tennis, and a pool table. Trained facilitators help kids tackle the ropes course where they learn teamwork and communication skills. A therapeutic horticulture garden is a great place to nurture plants and get dirty. A swing set, sand box and climbing wall gives kids an opportunity to play. The Family Resource Center houses the Community-Based Services team of outreach staff and in-home therapists. The Outreach Manager works with clients from the community to help them access services and resources. Discovery Home is a program for teen boys ages 14 to 18. 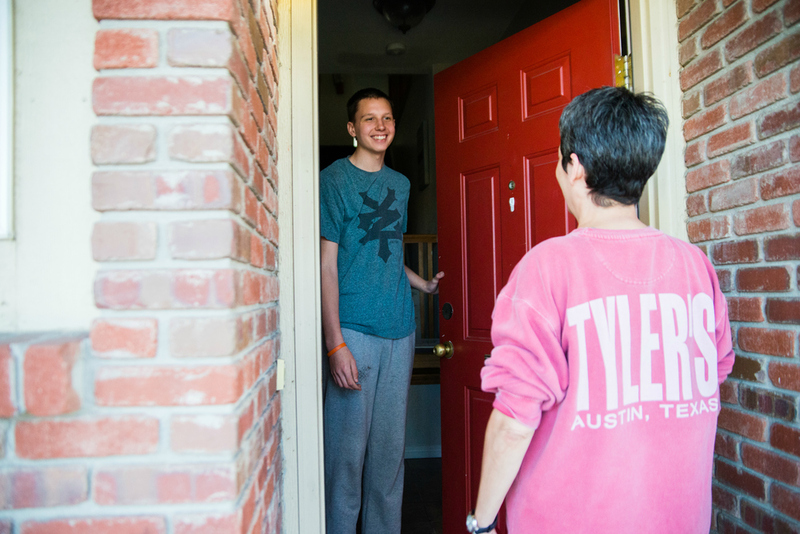 Discovery Home offers supportive, transitional housing for teen boys who also struggle with a mental health diagnosis.